IN A BARREN desert, under a blistering sun, a woman leaned against the trunk of a twisted tree, cradling her infant and trying to shield him from the merciless elements. With only a small water-skin and a bag of dates that was already worrisomely light, she watched as her husband turned his back on her and walked away. As he drew further and further away, she couldn’t bear it anymore. “Are you leaving us?” she called out to him. She received no response; the only sound was that of his footsteps in the sand, leaving behind no footprints. “Are you leaving us in this valley, where there is no one and nothing?” she cried out again, looking down at her son’s tiny face. Her heart lurched with panic at the idea of being alone in this empty place, desolate as it was – and then, almost instantly, another thought occurred to her and her heart leapt instead with a sense of certainty. Intuitively, she knew that despite the circumstances, nothing would harm her or her son; something greater awaited her, though she had no idea what it was. “Has Allah commanded you to do this?” she asked, her voice steady. The man paused, and nodded. “Then He will never neglect us,” she said quietly. 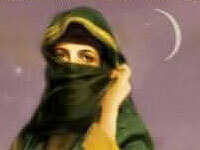 Unseen by Hâjar, her husband smiled sadly and then, when he was out of sight, raised his hands in supplication. Behind him, leaning against the tree, Hâjar (English: Hagar) prepared herself for a future which held far more than she could ever imagine. I am satisfied to be with Allah, she murmured, [i] and knew that no matter how empty the desert was around her, she would never be truly alone. In that one moment, this woman’s intuition, and her trust and certainty in her Lord, made her one of the greatest individuals in all of history. Hâjar went from being an unknown slave woman in Egypt to a symbol of spiritual conviction, deep insight, and decisive action. Although she is best known as the wife of Prophet Ibrahim and the mother of Ismâᶜîl (English: Ishmael), she was recognized by Allah and His Messenger in her own right. Her story is one of those which we repeat often, familiar to us all, and yet one which holds so much more for us than merely the rote lessons we have been taught. Her words, echoing in the desert, rang strong with tawakkul (reliance) upon Allah, but her words were far more than a hollow spiritual mantra. Hâjar was a woman who did not allow her circumstances to overwhelm or control her; she was not content to simply declare faith in God while remaining passive. Instead, Hâjar exemplified what it meant to be pro-active and determined even in the face of obstacles seemingly impossible to overcome. Stranded in the desert, surrounded by sand and little else, with a child dependent upon her for survival, Hâjar was not content to remain idle or to surrender herself to the seemingly inevitable, or to await a miracle from the heavens to be handed to her. She seized control where there was little to be had. Determined to find something to change her condition, she strode between Safa and Marwa, unrelenting in her persistence. She was acutely aware of the fact that her position was not an easy one, and that her son’s life was in jeopardy. No doubt, it would have been all too easy for her to break down into tears, to allow herself to be a victim of circumstances, or to be paralyzed by fear. However, Hâjar chose instead to place her trust in Allah and actively pursued a course of action which –though it may have seemed futile to anyone watching– exemplified her spirit of resilience and purposefulness. Nor did she give up after one or two attempts, and accept failure as an option –or as the likely outcome. Seven times – in the blazing heat, her infant’s wails ringing in her ears even as the land around her remained deafeningly silent – seven times did Hâjar ascend the hillocks of Ṣafa and Marwa, seven times did she struggle to seek sustenance and aid for herself and her child, seven times did she push herself past the limits of her weariness and her worry… Then, and only then, once she had done everything she possibly could, did Allah send the angel Jibrîl (English: Gabriel) from the seven heavens to the earth, to dig his wingtip into the parched earth and release the flowing waters of Zamzam. Yet even then, as the pure, crystalline liquid poured over her hands, Hâjar didn’t allow herself to get swept up in the moment. With brilliant foresight, she knelt down and formed the first boundaries of what will forever be known as the Well of Zamzam. And even when Allah fulfilled the du¢â’ of Ibrahim by sending the tribe of Jurhum to settle in that once-barren land, Hâjar never let herself become complacent or naively think that all her problems were solved. “You may use the water,” she told the tribes people, “but it will always belong to me and my son.” Her words were a sign of her shrewd foresight; not only was she protecting herself and Ismâᶜîl, but she was preserving a miraculous legacy for all of humankind. The waters of Zamzam remain safeguarded and cherished as a reminder of Allah’s innumerable blessings even in times of severe tribulation. May Allah have mercy on the mother of Ismâᶜîl! The Prophet supplicated for her, [ii] and we too echo his words –for in Hâjar we have the most beautiful and enduring story of a believer’s test of faith in a hopeless time, a single parent’s struggle for survival against all odds. Today, the Muslim Ummah has many others like Hâjar, single mothers and single fathers alike; those who have found themselves unexpectedly on their own, stranded by fate in circumstances beyond their choosing, and left with only their trust in Allah and their own indomitability to help them traverse this unforeseen destiny. These women and men are an example for us all: like Hâjar, they do not let themselves be victims of circumstances, but are determined to find a solution regardless of how hopeless their plight may seem. They rely upon Allah, knowing that He is Al-Razzâq (the Provider), and knowing also that He will not change the situation of a person unless they change themselves. [iii] In a world where it is increasingly difficult to raise a family, these single parents push themselves beyond what many of us could imagine –unfaltering in their belief in their Lord, their desire to raise their children to love Him and worship Him, and to protect them from the harsh realities of poverty, social injustice, and more. Alas, many Muslims do not honor these heroes and heroines of our Ummah as they deserve to be honored. Far too many of us view single parents as somehow lacking, or less worthy of respect. We do not realize that the struggles they are experiencing are in fact the same ones that Hâjar went through herself –for which she was honored by the Lord of the Worlds, Who decreed that it was obligatory for every Muslim to follow in her footsteps between Ṣafa and Marwa during both Hajj and Umrah. How can we claim to fulfill the spirit of the pilgrimages if our feet travel between those two mountains, yet our hearts remain unmoved by the greatness of Hâjar, and all those who embody her spirit on a daily basis? Hâjar is a woman whose story is an inspiration to us all, whether single parents or otherwise. She was an individual who refused to take on the identity of victimization, an attitude of helplessness, or acceptance of failure; she knew that while Allah would never abandon her, she could not abandon herself either. No matter what difficult straits we find ourselves in – financial, emotional, or otherwise – it is Hâjar whom we should remember when we are tempted to surrender ourselves to a sense of defeat. Her taqwa, her tawakkul, and her spirit of resilience was stronger than the landscape she traversed: a true heroine of Islam.